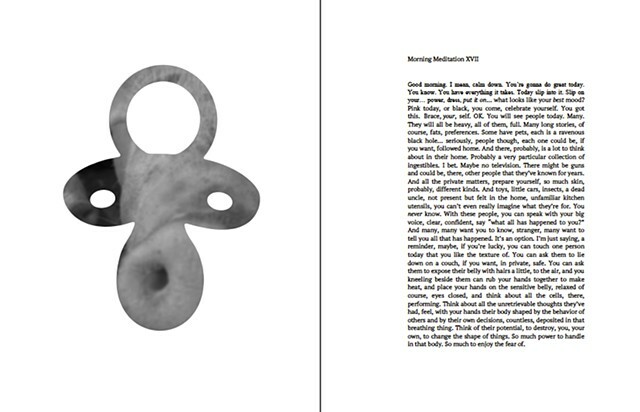 Image from a forthcoming book called "Pacifiers" that pairs absurd meditations with images of a calm pig's face tucked into pacifier silhouettes. The book will come with a tape containing readings of the meditations. Good morning. I mean, calm down. You’re gonna do great today. You know. You have everything it takes. Today slip into it. Slip on your… power, dress, put it on! What looks like your best mood? Pink today, or black, you come, celebrate yourself. You got this. Brace, your, self. OK. You will see people today. Many. They will all be heavy, all of them, full. Many long stories, of course, fats, preferences. Some have pets - each is a ravenous black hole… seriously, people though, each one could be, if you want, followed home. And there, probably, is a lot to think about in their home. Probably a very particular collection of ingestibles. I bet. Maybe no television. There might be guns and could be, there, other people that they’ve known for years. And all the private matters, prepare yourself, so much skin, probably, different kinds. And toys, little cars, insects, a dead uncle, not present but felt in the home, unfamiliar kitchen utensils, you can’t even really imagine what they’re for. You never know. With these people, you can speak with your big voice, clear, confident, say “what all has happened to you?” And many, many want you to know, stranger, many want to tell you all that has happened. It’s an option. I’m just saying, a reminder, maybe, if you’re lucky, you can touch one person­ today that you like the texture of. You can ask them to lie down on a couch, if you want, in private, safe. You can ask them to expose their belly with hairs a little, to the air, and you kneeling beside them can rub your hands together to make heat, and place your hands on the sensitive belly, relaxed of course, eyes closed, and think about all the cells, there, performing. Think about all the unretrievable thoughts they’ve had, feel, with your hands their body shaped by the behavior of others and by their own decisions, countless, deposited in that breathing thing. Think of their potential, to destroy, you, your own, to change the shape of things. So much power to handle in that body. So much to enjoy the fear of.